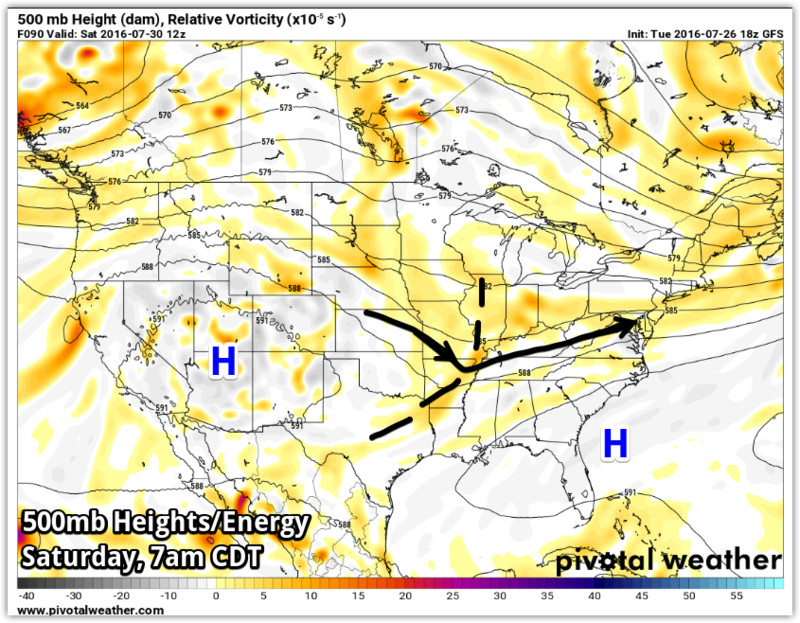 The heat and humidity of the past week(s) is about to take a break as the Mid-South weather pattern shifts from one dominated by surface high pressure and ridging aloft to one more conducive to rain, some heavy, and thunderstorms. This pattern takes us into the weekend before high pressure starts building back early next week. 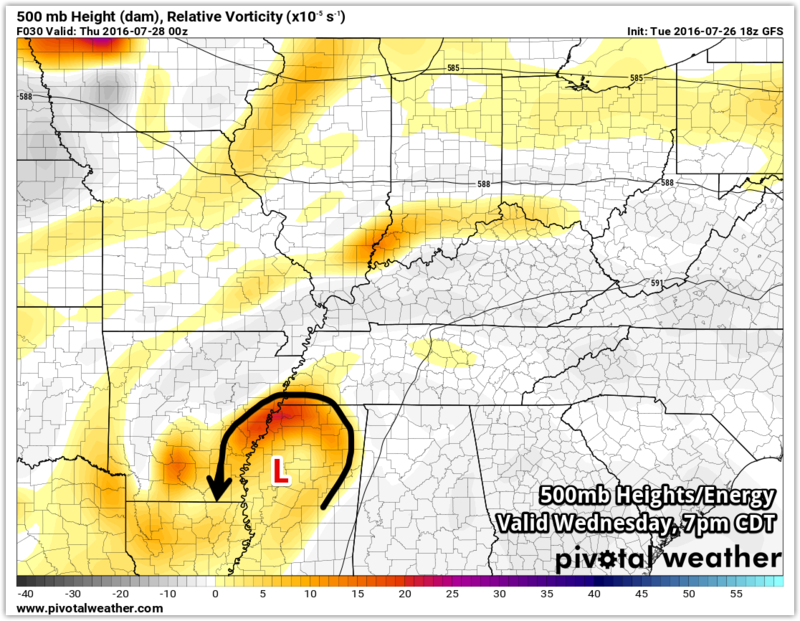 On Wednesday, weak low pressure of tropical origin moves slowly north from Louisiana into the Mid-South. As it does, moisture values increase to very high levels as lift provided by the approaching low and mid-level energy combine to produce showers and thunderstorms across the region. Though a few will be possible throughout the morning, chances increase to "likely" by lunchtime or just after in the metro. Severe weather is not expected as wind energy remains low and instability (the fuel for the fire) will be present, but not overly concerning.A few storms could produce some wind gusts, but the main threat we'll be monitoring will be heavy rain and the potential for low-end flash flooding. 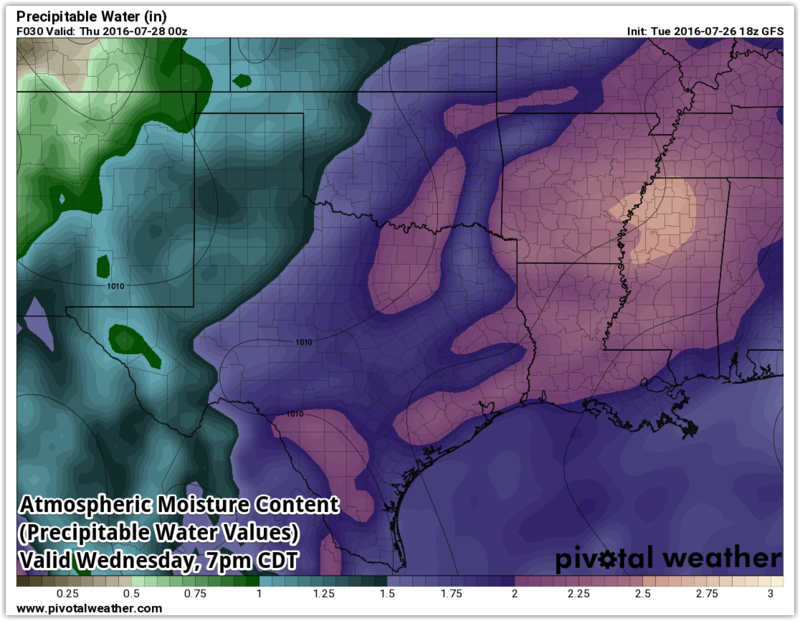 Precipitable water (PW), a measure of total atmospheric moisture content at all levels, increases to near record levels by Wednesday evening, nearing 2.5" as tropical moisture moves over the region. PW tells us how much water is in the air that can be "rained out." Graphic courtesy Pivotal Weather. On Wednesday afternoon, a weak surface low moves slowly into the region as moisture increases, bringing enhanced lift in the atmosphere that generates precipitation. Graphic courtesy Pivotal Weather. As the surface low moves into the region, so too does a mid-level low/disturbance (500 mb or about 18,000') with fairly strong lift (depicted by the yellow to orange colors). That should help to focus to the heavier precipitation during the afternoon and evening hours on Wednesday. Graphic courtesy Pivotal Weather. This pattern takes us into Thursday as the low meanders to our west and washes out, but a trough of lower pressure forms over the region at the upper levels. 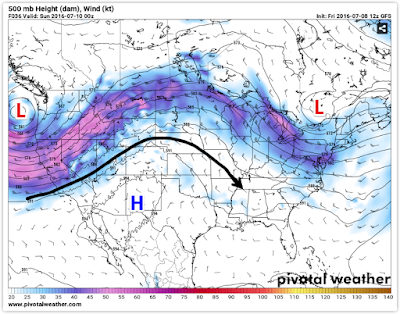 High pressure ridging aloft is conducive to sinking air and drier, warmer weather, but lower pressures, such as those associated with a trough, foster rising air, more clouds, and a wetter pattern. With mid and upper level disturbances moving through the trough aloft, the wet pattern will continue into late week and then the weekend. 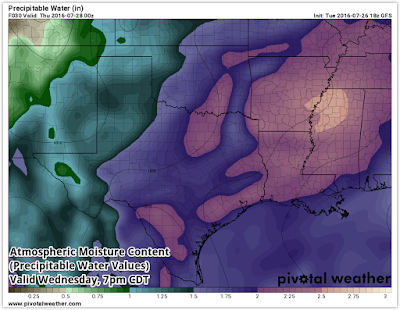 Wednesday and Thursday currently have the best chances of continuous precipitation. The good news is that cloud cover and rain will keep temperatures out of the 90s for a couple days and rain will also make a dent in our recent precipitation deficit. The GFS model forecast mid-level (500 mb or 18,000') pressure map valid Saturday morning shows the trough of lower pressures over the Mid-South as wind flow "kinks" from northwest to southwest near the Mississippi River. The axis of the trough is shown by the dashed line. The trough and energy flowing through it (yellow/orange) enhances lift, which generates showers and thunderstorms. Several of these mid-level disturbances are forecast to move through the general trough into the weekend. Graphic courtesy Pivotal Weather. Scattered showers and thunderstorms, especially those associated with the approach of upper level energy (which can't be timed specifically this far in advance) and daytime heating, will continue to be possible Friday through Sunday. 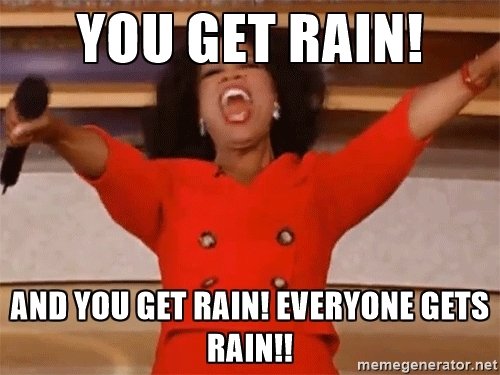 Rain chances these days are near 50%. The chance for a few strong storms increases slightly this weekend as rain becomes more sporadic and daytime heating allow temperatures to return to near 90. 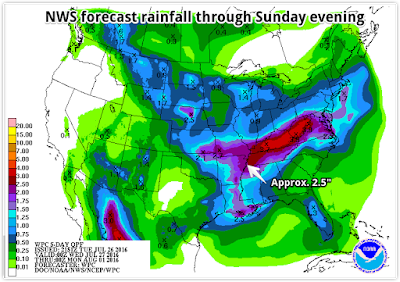 NOAA/NWS predicts heavy rainfall over the next 5 days south of the Ohio River into the Mid-Mississippi River Valley. 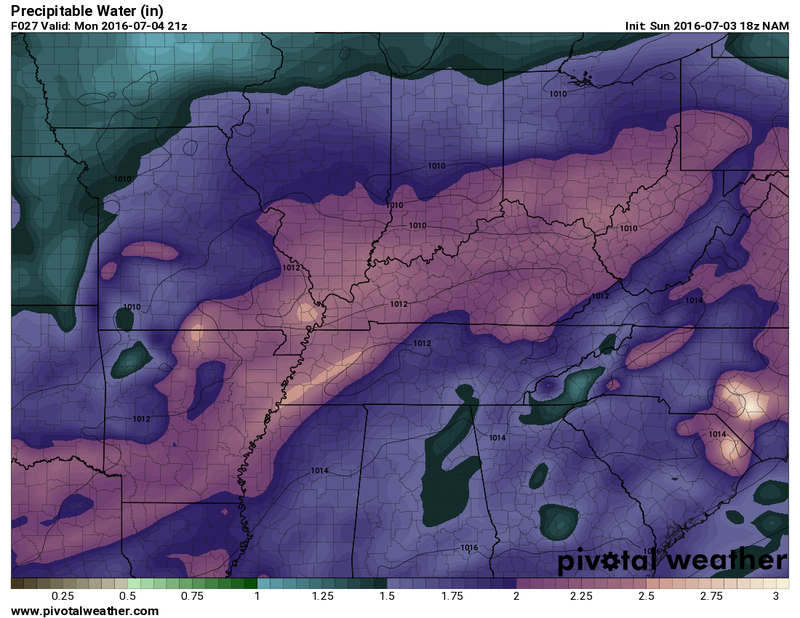 The Memphis area could easily see 2-3" of rain with some areas that get thunderstorms receiving more. 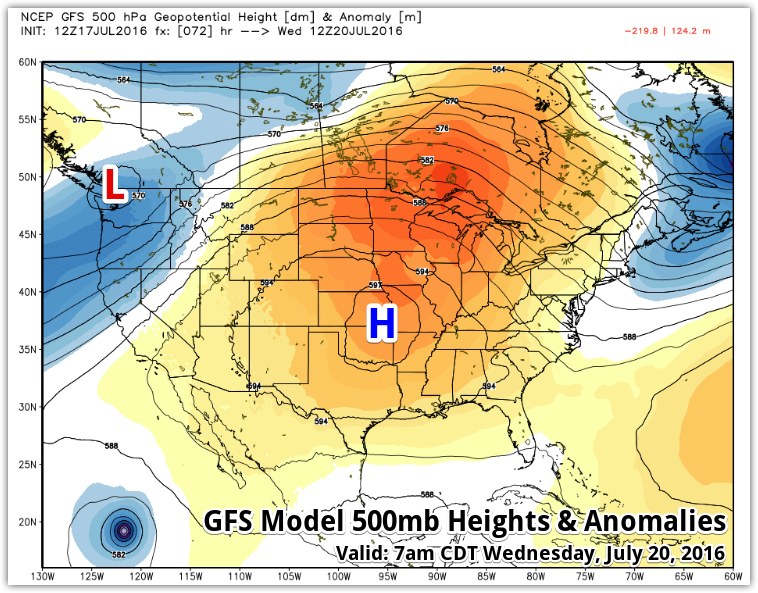 By early next week, high pressure aloft begins to re-build over the region, squashing rain chances and bringing a return of summertime heat. That process will take place gradually the first half of next week. For those with outdoor plans the next several days, keep a close eye on the sky and StormView Radar on MemphisWeather.net and our mobile apps (links below), and have your backup "plan B" ready! We'll be keeping you updated via social media as well. The summer of 2016 (at least meteorological summer, which consists of June, July, and August) is halfway over, and though not record-breaking, it has certainly been consistently hot! Last month was the seventh warmest June on record in Memphis as high temperatures averaged nearly four degrees above the long-term average of 88.9° and low temperatures were more than three degrees above the climate average of 70.3°. So far, through the 16th, July has had an average high of 93.2° (1.6° above normal) and an average low of 76.1° (2.3° above normal) for an average temperature for the month that is nearly two degrees above normal. Speaking of unrelenting, since June 1, the coolest high temperature has been 87°. We are in the midst of a streak of 32 consecutive days with high temperatures at or above 89° that started June 15. In fact, if it weren't for a high of 89° on July 11, that streak would be for temperatures at or above 90°. One additional statistic that speaks to the persistence of the heat is this: since May 24, only four days have had daily average temperatures below normal, and each of those was only 1-2° below normal. Despite all that heat, only two records have been set or tied and both were for warmest daily low temperatures (80° on June 25 and 81° on June 17). I'll say it again, we simply haven't caught a break! An analysis of the departure from normal temperatures for the past 45 days (since June 2) shows the widespread nature of the warmth across the U.S. with the only below normal temperatures in central TX, along the CA coastline into the Pacific Northwest, along the U.S./Canadian border into New England, and a small portion of the Mid-Atlantic. Graphic courtesy WeatherBell. Looking ahead in the short-term, upper level high pressure strengthens across the southern U.S. over the next day or so, then expands northward towards Canada into the Midwest. That means no relief in sight this week from the heat, and in fact, high temperatures on a few days could get near the warmest days so far this year (98° on three days in late June). The GFS model shows a massive ridge of high pressure at 500mb (or about 18,000') centered over the Plains on Wednesday morning, which is representative of conditions for much of the coming week. Departures from normal conditions are indicated by color shading, with oranges being above normal and blues below normal. The strength of the high pressure indicates suppression of precipitation as weather systems move around the periphery of the high. Graphic courtesy WeatherBell. 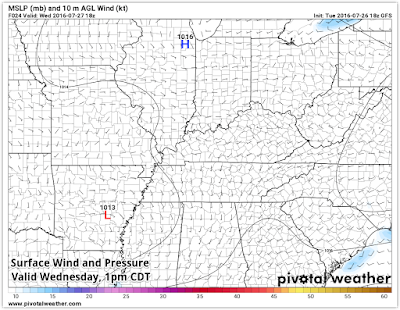 A weak upper-air disturbance will move into the region on Tuesday, perhaps bringing a thunderstorm or two, mainly to west TN, but that should have little effect on the temperatures that day, other than brief cooling for those that receive rain. With high pressure at the surface centered to our east, low level wind will be from the south, and you know what that means - the Gulf of Mexico will be "open for business!" As moisture streams into the region from the south, expect daily heat indices to be over 100° as highs reach the mid to upper 90s. Some days will see heat indices of 105-110°, necessitating Heat Advisories. Next weekend, a slight weakening of the ridge could mean very low rain chances re-appear. However, if you work outdoors, please take the heat seriously and find time for breaks and drink plenty of water this week. Click here for the detailed week-ahead forecast from MWN, or consult our website or mobile app (links below). As for the long-term, there's actually little hope for the rest of July as that ridge of high pressure will be the dominating force. The NOAA Climate Prediction Center outlook for the past week of July indicates a very strong chance that above normal temperatures continue. Long-range climate models also indicate a likelihood of heat remaining in place to some extent through at least mid-August. It could be interesting to see where the meteorological summer of 2016 ends up when compared to some of the hottest summers on record (as of now, only 1980, 2010, 2011, 2007, and 1954 have been warmer). 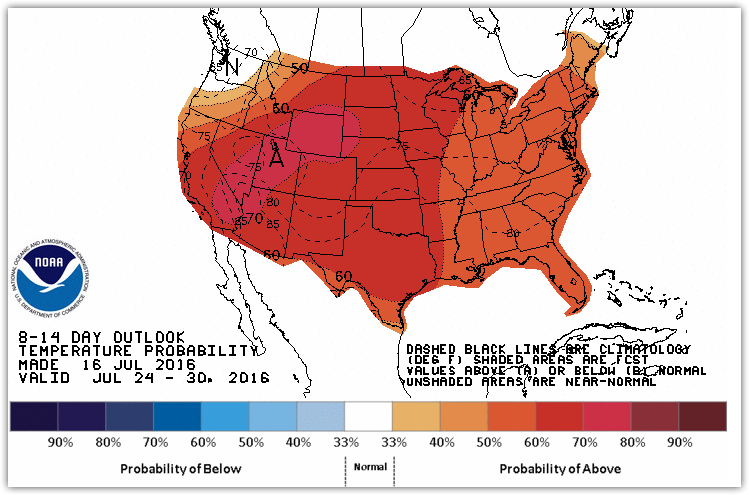 NOAA/CPC predicts with high likelihood (nearly 60%) that above normal temperatures will continue from July 24-30. 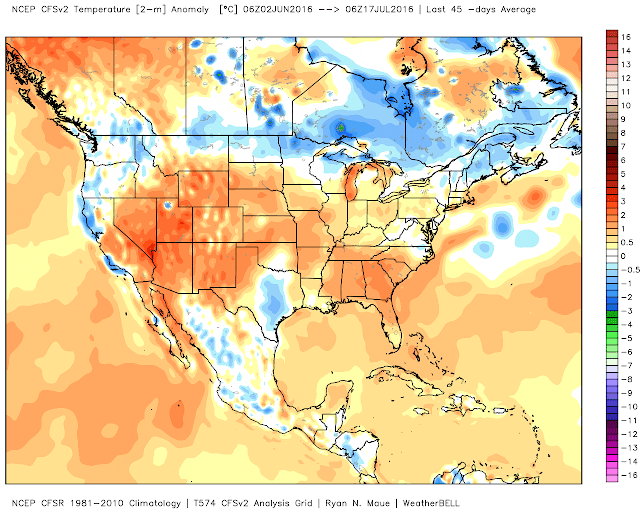 In fact, there is a high likelihood that all of the nation will experience above normal temperatures during this period except the Pacific Northwest. 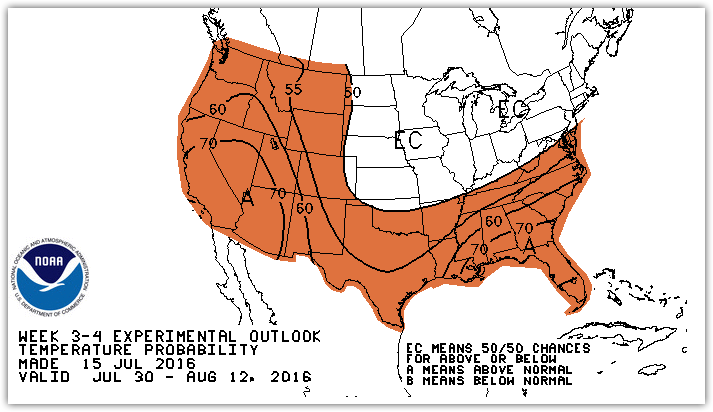 NOAA/CPC also predicts a better than 50/50 chance that above normal temperatures continue for the first 2 weeks of August across the southern U.S. and west of the Continental Divide. 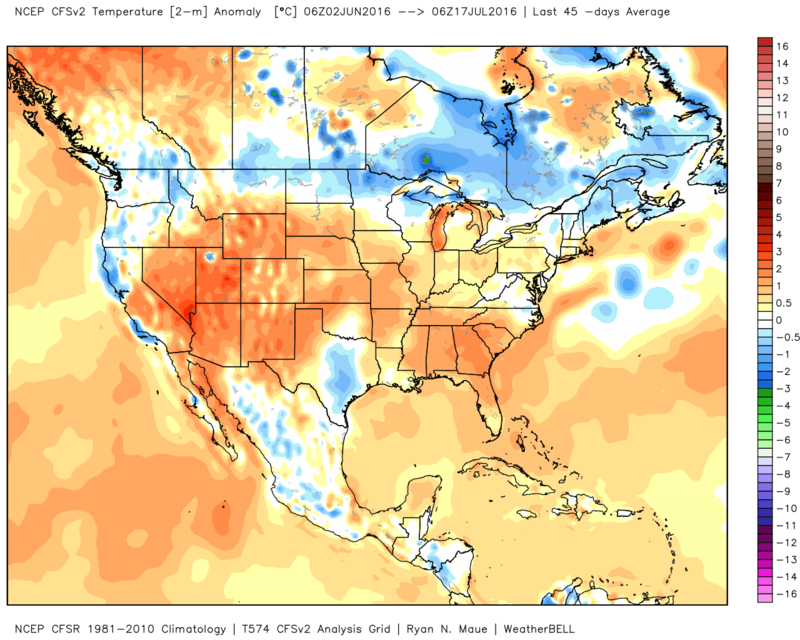 Very warm and dry would best define the month of June 2016. With 22 days above 90 degrees, and a few pushing 100 degrees, the month ended as the 7th warmest June on record. In fact, the average high temperatures and low temperatures for the month were about normal for the warmest days of the year in Memphis. In terms of precipitation, though thunderstorms were fairly abundant during the month, especially in the northern metro, the airport recorded only a little more than an inch of precipitation in what is already a fairly dry month on average. Many locations in the metro saw more than that from individual storms. 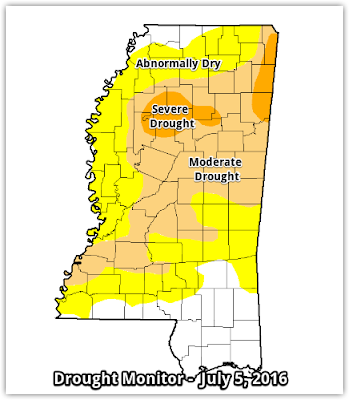 In north Mississippi, a mild drought developed, particularly south and east of the metro. 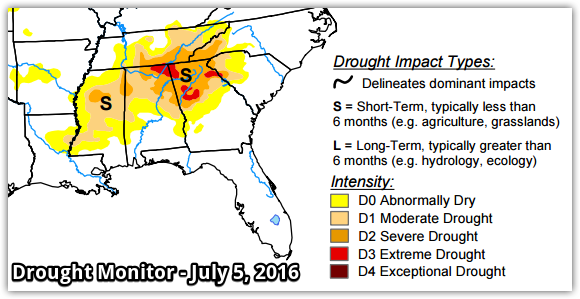 By early July, "abnormally dry" (or D0 on the drought intensity scale) conditions had developed into the southern metro. As for severe weather, severe weather reports of 60+ mph wind gusts and some damage occurred on June 16th and 27th, as well as a minor damage report on the 1st, all from thunderstorms. Heavy precipitation in the northern metro prompted a couple of flash flood reports on June 3rd. 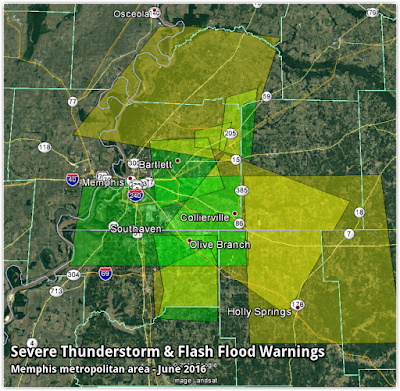 All Severe Thunderstorm (yellow) and Flash Flood (green) Warnings issued for the Memphis metro area in June 2016. Through the first half of 2016, the average temperature at Memphis International Airport is 61.1 degrees, which is 1.9 degrees above the long-term average. Precipitation measured 36.26", or 8.35" above average (130% of normal). Comments: 22 days recorded highs at or above 90 degrees in June, which is eight more than average. This month was the 7th warmest June on record in Memphis. Comments: The 27th was the only day in June on which more than 0.20" of rain fell. However, there were several storms that dropped more than an inch of rain on many locations across the metro. Through the first six months of 2016, Memphis International Airport has recorded 36.26" of precipitation, or 8.35" above average (130%). Click here for a daily statistical recap for Memphis International Airport. Click here for a daily statistical recap for Bartlett, TN. MWN's forecasts extend out five periods (2.5 days, or roughly 60 hours). Historical accuracy statistics can be found here. June was hot - the seventh hottest on record in Memphis. July is continuing that trend. In fact, as of 8am this morning, the official reporting station at Memphis International Airport had not dropped below 80° in 72 hours and that streak will continue today and likely until early Saturday morning when the forecast low is 79°. Overall, it's also been dry, though some places have received the benefit of scattered thunderstorms dropping heavy rain in localized areas over the past month. Areas just to our south and across the interior southeast are dealing with very dry conditions - drought in many cases. North Mississippi, including the southern metro, is on the edge of that drought area. 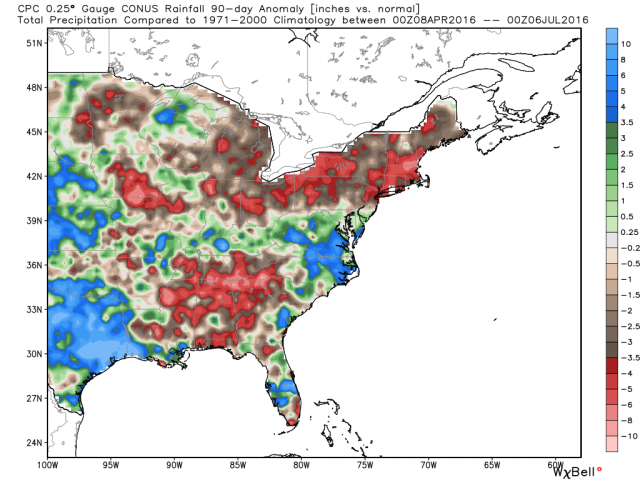 Precipitation anomaly (departure from normal) over the past 90 days shows large areas of the southeast U.S. with a deficit of multiple inches of rain through the spring and early summer. Graphic courtesy WxBell. Short-term drought (appearing in the last 6 months) is present throughout the interior southeast with greatest effects in northern GA/AL and the southern Appalachians. A close-up view of MS is shown below, indicating dryness into the southern metro (Tate, Tunica, and Marshall Co's). Graphics courtesy US Drought Monitor. As we head into the weekend, some much-needed rain is expected, though we are hopeful that severe weather does not accompany it. A weak cold front will be located just north of the metro with the possibility of storm systems riding along the front through the area. They will feed on the very unstable air that is in place south of the front, driven by the heat and humidity. The good news, I suppose, is that increased cloud cover and rain in the area should hold temperatures down just a bit this weekend. 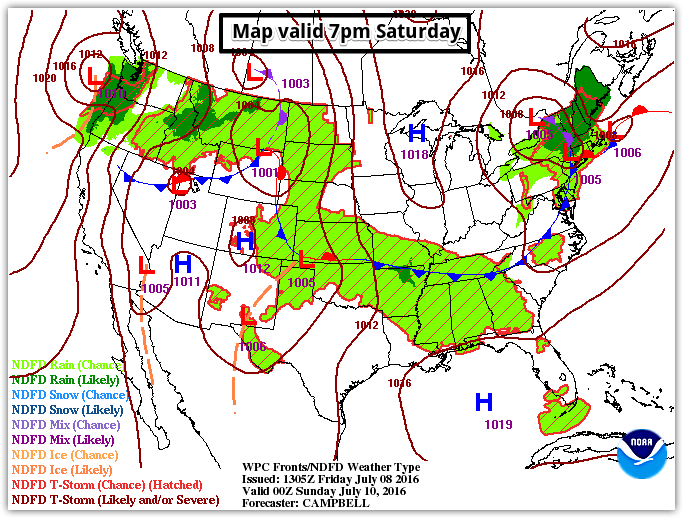 A weak cold front will stall over the Mid-South this weekend, becoming a focus for possible convective complexes with a chance of strong storms and heavy rain. If a storm complex or two (called MCC's, or mesoscale convective complexes) forms, they tend to continue through the night, not ending when the sun goes down. This scenario is very unpredictable beyond about 12-24 hours, thus nailing down timing of potential storms this weekend is difficult. The atmospheric pattern that favors these complexes will be partially in place however, with a general northwest to southeast flow at the mid-levels (what we call "northwest flow"), a weakness in the mid-level pressure pattern developing over the area, shortwave troughs (or upper air disturbances) moving near the region, and plenty of heat and moisture to feed the storms. 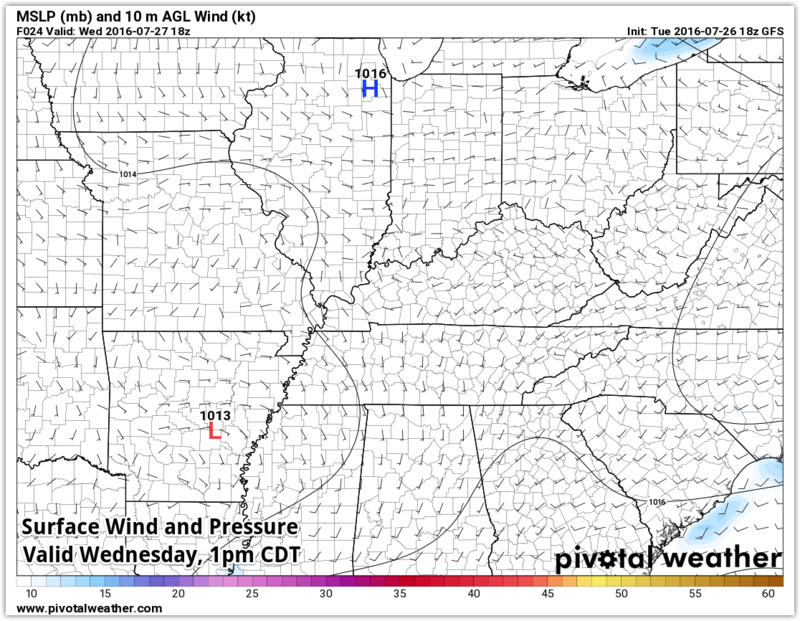 The GFS model of pressure at the 500mb (18,000') level at 7pm Saturday shows wind flow "ridging" over high pressure over NM with wind flow from northwest to southeast across the Mid-South. This is what is referred to as "northwest flow" and is a favorable pattern in the summertime for convective complexes to follow that wind flow. Graphic courtesy Pivotal Weather. The first of these storm clusters or complexes appears to skirt the northern metro early this evening according to this morning's high-resolution short term models. Thus, for what I think is the third time this week, areas just to our north are under a risk of severe weather, as forecast by the Storm Prediction Center. As of 2pm, the risk is in category 2 of 5, or Slight Risk, with the main period to monitor being late afternoon to early evening. 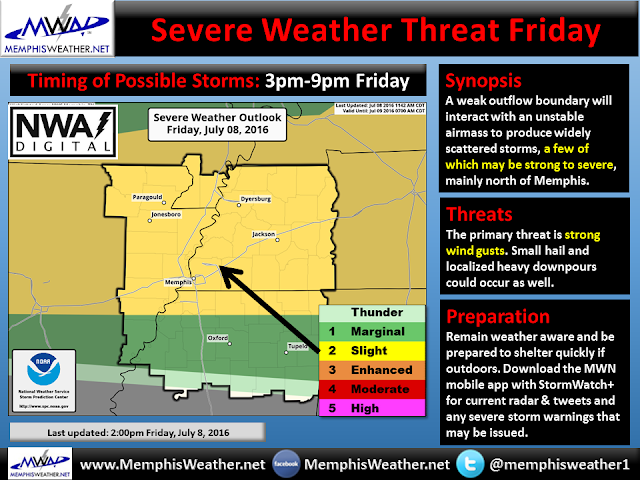 The primary severe weather threat will be damaging wind. Northeast AR and northwest TN have the best chance of storms with the tail end of the storms possibly reaching as far south as I-40 in the metro. Heading into the weekend, we'll simply advise that you keep a close eye on the forecast and our social media feeds as severe weather cannot be ruled out Saturday, Sunday or Monday while the front hangs over the area. Again, timing of storm complexes, or just pop-up storms, is nearly impossible to pinpoint right now. A few storms could get strong enough this weekend to produce areas of damaging wind or large hail, as well as very heavy rain. The one time period that has a little higher confidence level on is overnight Saturday night into early Sunday. Multiple models have depicted storms developing during that period. We're hopeful that they hold off until after Saturday evening outdoor activities have wound down, including the Levitt Shell ticketed event featuring Sharon Jones and the Memphis Redbirds Christmas in July evening with baseball, fireworks, and Santa (I wouldn't want to be the one in the Santa suit outside in July)! 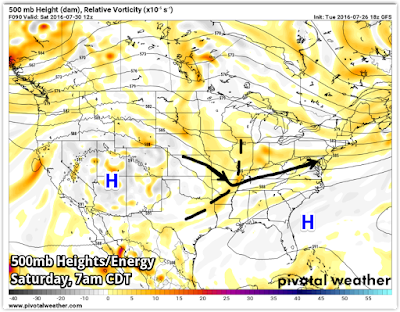 By early next week, upper level ridging (high pressure) begins building back into the region, pushing the thunderstorm threat back to our north and allowing mid-summer heat to rebuild with highs back in the mid 90s and heat indices above 100. The long-range outlook for the third week of July is predicted to have a high likelihood of more "above normal" temperatures. Hang in there and stay cool! 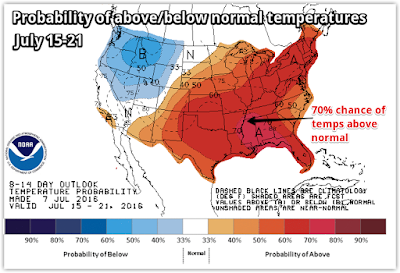 The week 2 outlook from NOAA's Climate Prediction Center indicates a 70% chance of temperatures remaining above normal. In other words, a respite from the summer heat doesn't appear to be in the offing during this period! It's been a hot holiday weekend with a couple of stray showers that provided very brief respites for those lucky enough to be under one. Looking ahead to your "bonus weekend day" tomorrow, the weather unfortunately won't cooperate nearly as well. However we're hopeful that most thunderstorm activity ends before sunset so that all local fireworks displays can go on as planned! Tomorrow's increased thunderstorm chances come courtesy of an mid-level (about 18,000' up) disturbance (or shortwave trough) that will move towards the region. A cold front remain anchored to our north, which keeps the Mid-South in a hot, humid, and unstable airmass as the disturbance approaches with temperatures reaching the lower 90s by early afternoon and dewpoints in the mid 70s. That disturbance will provide the lift necessary to trigger scattered thunderstorms as instability increases, most likely from late morning through the afternoon hours. A cold front will be well north of the Mid-South, allowing for temperatures to reach the lower 90s on Monday. This warm air, along with abundant moisture, will help provide the "fuel" for mainly PM thunderstorms as a shortwave trough approaches. Depicted above is the NAM model's prediction of the atmosphere at about 18,000' Monday afternoon. A shortwave trough (indicated by the black curved line) will be moving into the region with positive "vorticity" (or spin, indicated by the orange/red/purple colors) providing the lift to generate thunderstorms as it moves closer. Meanwhile, precipitable water values (PWs) will be very high, indicating an abundance of moisture in the atmosphere over the Mid-South, which will contribute to heavy rainfall from any storm that forms. Values over 2" (pinks) are high enough to cause flash flooding, especially if multiple storms traverse an area. With expected daytime convection, hopefully it will stabilize the atmosphere some, thus as dusk approaches, activity should wind down heading into the overnight hours. 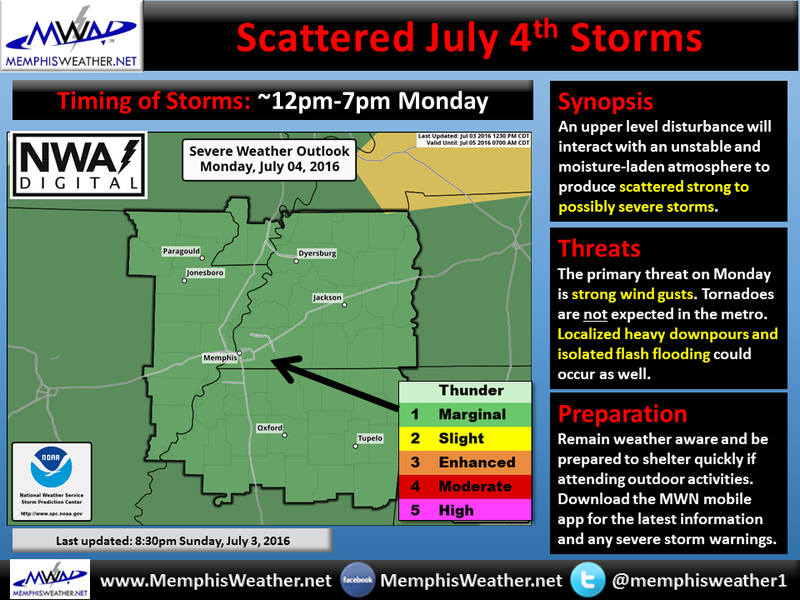 The most difficult part of the forecast is determining when that decreasing trend commences and if any leftover showers or thunderstorms persist by the time fireworks are set to glow over the Mid-South. As for any threats from tomorrow's storms, with instability high, atmospheric moisture very high, and a bit of mid-level wind energy, a few storms could bring the threat of strong wind gusts from microburst downdrafts, as well as very heavy rain. Tornadoes and hail are not expected from this setup, though a storm or two could conceivable produce some pea-size hail. As of now, the metro is under a Marginal Risk (category 1/5) of severe weather with a few storms possibly producing severe weather. 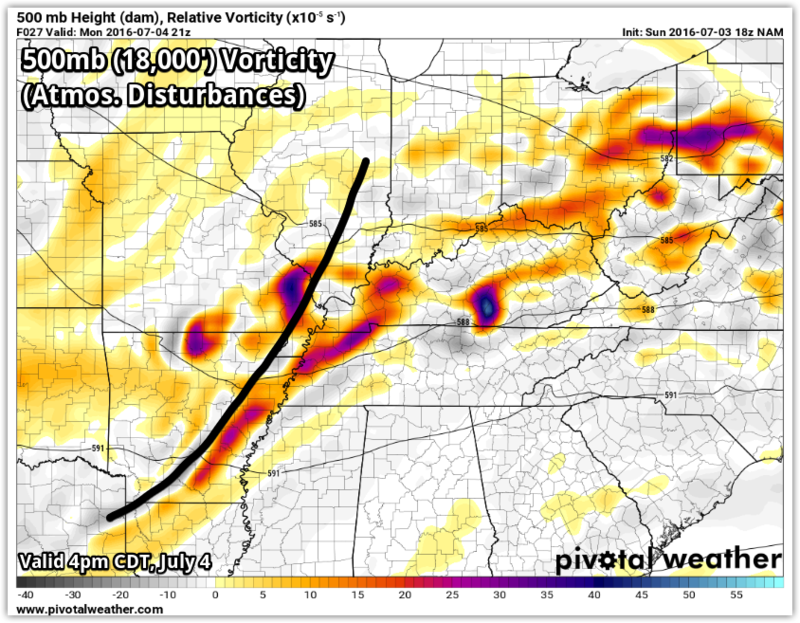 These would be most likely when instability is maximized during the afternoon hours. To recap, a slight chance of showers in the morning quickly becomes a good chance of scattered thunderstorms (a few with strong wind gusts and most with heavy downpours) by early afternoon, tapering to low chances of a few showers or a thunderstorm by 9-10pm. If you have outdoor plans tomorrow afternoon and evening, pay particular attention to the weather scenario and be prepared with a plan B no matter where you are. If you hear thunder, you're close enough to get struck by lightning. Quickly move the party indoors until the storm passes (we aren't expecting any all-day washouts)! Also know that loose outdoor objects could get blown away if a storm passes overhead and that localized flash flooding is possible, especially if multiple storms affect a single area. 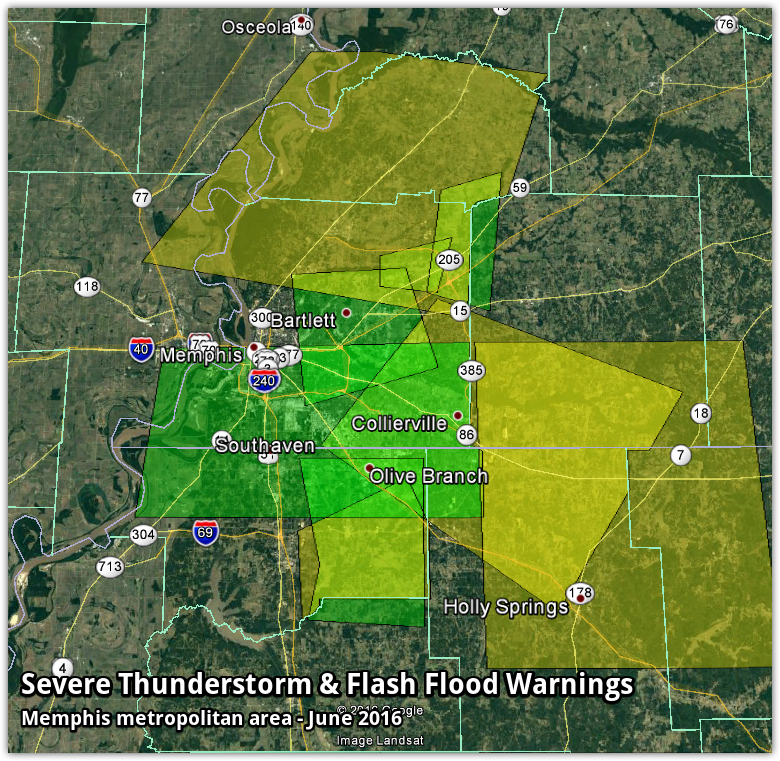 We highly recommend the MemphisWeather.net mobile app to monitor radar trends and our latest Twitter activity on storm locations/threats. In addition, StormWatch+ in the app will be a handy tool to alert you to any severe weather threats in your area as you're going about your day. Links to the app are available below.